Abstract: Ventricular septal defect (VSD) is a lethal complication of myocardial infarction. The event occurs 2–8 days after an infarction and patients should undergo emergency surgical treatment. We report on successful device closure of post-infarction VSD. A previously healthy 66-year-old male was admitted with aggravated dyspnea. Echocardiography showed moderate left ventricular (LV) systolic dysfunction with akinesia of the left anterior descending (LAD) territory and muscular VSD size approximately 2 cm. Coronary angiography showed mid-LAD total occlusion without collaterals. Without percutaneous coronary intervention due to time delay, VSD repair was performed. However, a murmur was heard again and pulmonary edema was not controlled 3 days after the operation. Echocardiography showed remnant VSD, and medical treatment failed. Percutaneous treatment using a septal occluder device was decided on. 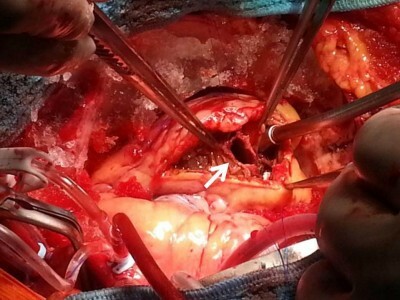 After the procedure, heart failure was controlled and the patient was discharged without complications. This is the first report on device closure of post-infarction VSD in Korea.